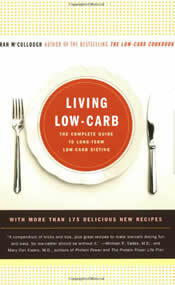 Living Low-Carb is the creation of Fran McCullough who is an award winning cookbook editor. While struggling with her own weight loss issues McCullough found that low carb dieting helped her to achieve the results she was looking for. McCullough was not willing to forgo pleasurable foods in order to maintain her low carb lifestyle so she was prompted to put together a collection of recipes for a book called The Low-Carb Cookbook, which was to become a best seller. Living Low-Carb is the follow up to her first book and it includes 175 low carb recipes as well as more detailed explanation and advice about low carb dieting. The major emphasis of McCullough’s book is on adapting low carb diets so as to make them more enjoyable and to allow for delicious meals without compromising the principles of the diet. It is not a diet book as such but more of a general guide to living a low carb lifestyle. McCullough does however provide some advice to increase a low carb dieter’s chance of success based on her own experiences and knowledge. Fruit should be eaten at breakfast and dieters are advised to emphasize low carb fruits such as berries, kiwi, melon, and peaches. She also advises dieters to consume protein at every meal and recommends an amount of half a gram of protein for each pound of the dieter’s ideal weight. For maximum weight loss the carbs should be kept below 30 grams daily with cream and butter consumption limited. Dinner should be eaten as early as possible and should be kept small. McCullough does a good job of explaining the differences between the various approaches to low carb dieting and discusses the science and medical rationale behind them. Green leafy vegetables, turnips, cauliflower, daikon radish, berries, melons, peaches, peanuts, avocado, olive oil, sesame oil, eggs, cheese, chicken, meat, fish. Other Low Carb and High Protein recipes can be found here. Exercise is encouraged for its health benefits rather than for any specific weight loss effects. Living Low Carb retails at $19.99. There may be an increase in grocery expenses due to the need to purchase high protein foods. Makes it easier to follow a low carb diet by providing many tasty recipes. Recipes include information on carbohydrate content. Low carbohydrates can increase the rate of initial weight loss. Provides unique information for dieters with low thyroid function. Gives advice for vegetarians, diabetics and pregnant or nursing women. Includes practical tips for eating out and how to deal with sweet cravings. Provides alternatives for favorite high carb foods such as pizza and mashed potatoes. Helps dieters discern the differences between the varieties of low carb diets that are available. Many readers will relate to the conversational writing style of the author. Some dieters do not respond well to the higher intakes of protein and fat. Many dieters function better with a higher amount of carbohydrates, especially those who are very physically active. Low carb diets are often lacking in adequate fiber. Recommends the use of supplements such as L carnitine, which have not been proven to be effective for weight loss. Does not provide calorie information for recipes. Although studies suggest that low carbohydrate diets are not superior to other dietary approaches for long-term weight loss they do appear to me more effective in the short term. This may give the dieter a boost in motivation that could increase the likelihood of adhering to a long-term weight loss program. McCullough provides many interesting recipes suitable for a low carb diet and this book will appeal to dieters who do not want to give up delicious foods but would like to try a low carb diet. Her book may also help inspire long-term low carb dieters and strengthen their commitment to low carb dieting by providing appealing and tasty meal ideas.